Inspired by the success of my first lunch box batch up I was back in the kitchen on Sunday ready to go again. 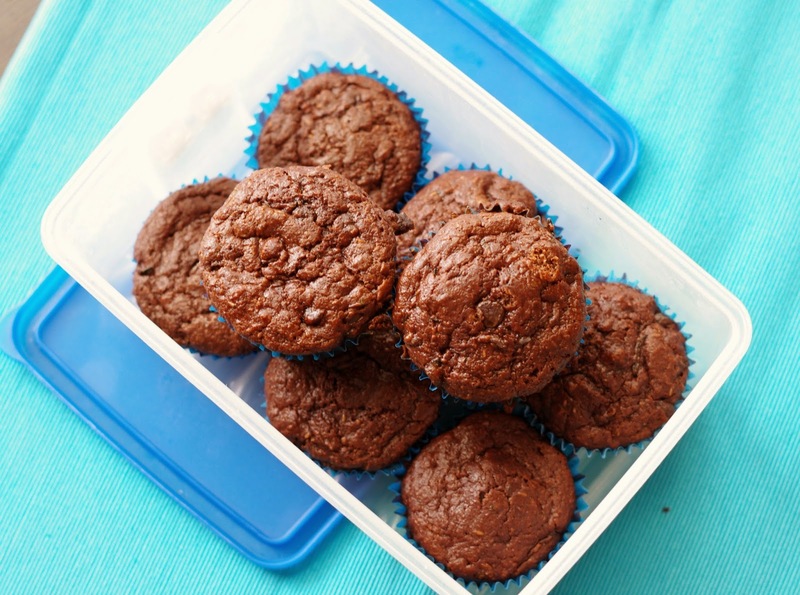 As I was baking I mentioned to my husband how lucky I am to only have to cater for one school lunch box - if I make one batch of muffins I'm set for 2 weeks. It made me realise how quickly your baking quantities would need to increase when you have multiple kids at school or when you need to start to cater for the huge appetites of older growing hungry boys! It must be said these muffins only last the two weeks because I freeze half of them, so that I resist the temptation to eat them all myself, and because I also make a separate morning tea option for my husband. This week his treat of choice was my Cherry Ripe Slice which is not such a healthy option for MJ to take to school! This recipe is great for the people who currently have a huge quantity of zucchini growing in the veggie patch and they are also cheap to buy at the moment. My little man was initially a little sceptical, questioning with a frown 'what are the green bits?' But after bargaining with him to give them a try them he now can't get enough. You may want to make sure that you grate the zucchini quite finely if you think this may also turn your little ones off trying them. 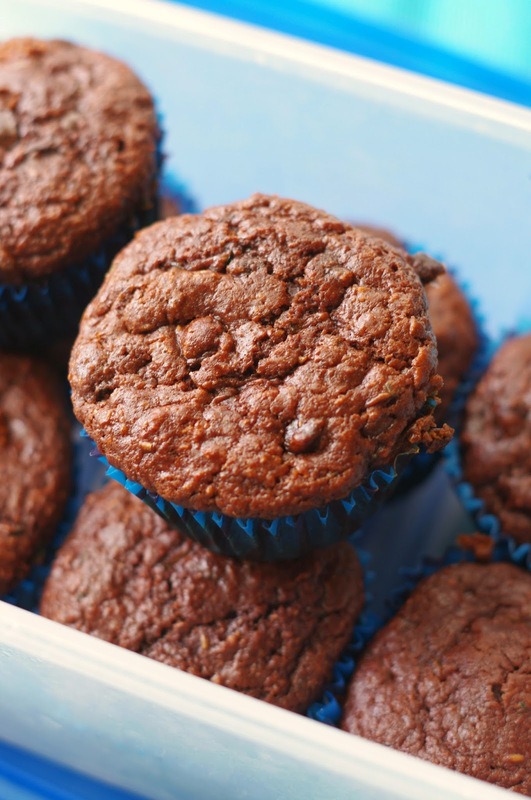 However rest assured that you can't taste the zucchini, it just helps to keep the muffins moist and boost their nutritional value. 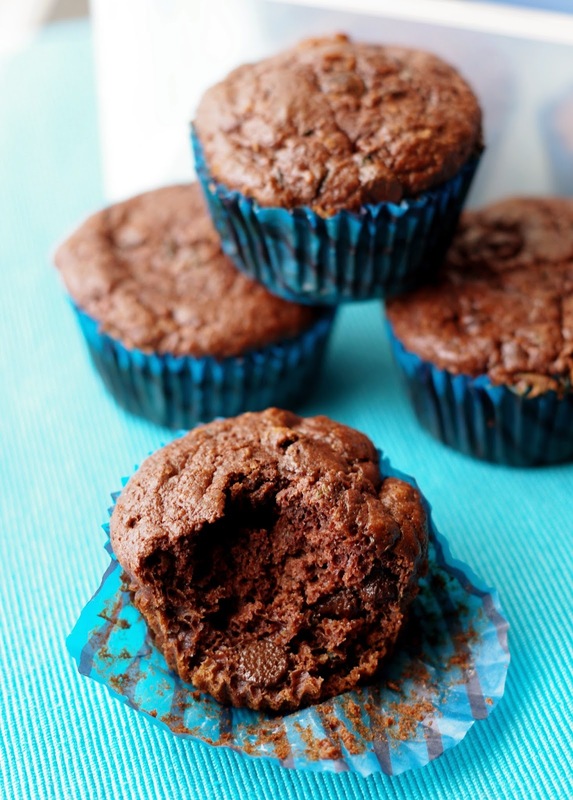 In fact these muffins have a stronger chocolate flavour compared to many other chocolate muffins I have made in the past. You could use 1/4 of a cup of raw cacao powder instead of the cocoa powder to increase the nutritional punch and you can use any milk you like including buttermilk or almond milk. I hate using more than one bowl when baking so I mix my wet ingredients first and then combine the dry ingredients together in a sieve held over the top of the bowl and then mix it all together. (If a recipe doesn't use cocoa then I don't worry about sifting them, I just add them straight in). If you get annoyed with the bottom of your muffins sticking to the liner, give them a light spray with cooking oil (I used a coconut oil spray) and they will come out beautifully leaving no deliciousness behind. JJ is becoming a serial photo bomber! Pre-heat oven to 175-180 degrees Celsius. Place muffin liners in 12 cup muffin tin and lightly spray with cooking oil. Grate zucchini finely and squeeze firmly to remove excess water (don't be tempted to skip this step!) In a large bowl whisk melted coconut oil, rice malt syrup, vanilla, egg and a pinch of salt. Add zucchini, apple sauce and milk and mix well to combine. Combine dry ingredients (flour, cocoa, baking powder and baking soda) and gently fold through wet ingredients until just combined. Gently fold in chocolate chips to finish. Evenly fill muffin liners and bake for 20 minutes or until a skewer pressed into the middle of a muffin comes out clean. Allow to cool in tray for 5 minutes then turn out onto wire rack. Do you like to include vegetables in your baking? Do your kids notice? Linking up with Fabulous Foodie Fridays - check it out for a great range of delicious recipes. Yum! I love the combination of chocolate and zucchini.... perfect!